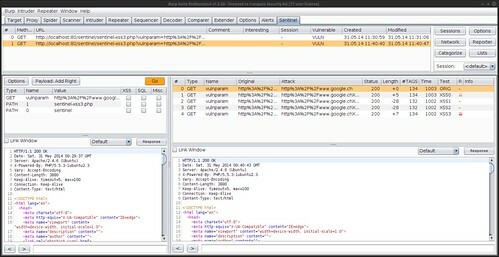 BurpSentintel is a plugin for Burp Intercepting Proxy, to aid and ease the identification of vulnerabilities in web applications. Searching for vulnerabilities in web applications can be a tedious task. Most of the time consists of inserting magic chars into parameters, and looking for suspicious output. Sentinel tries to automate parts of this laborous task. It’s purpose is not to automatically scan for vulnerabilities (even if it can do it in certain cases), as there are better tools out there to do that (BURP scanner for example). So it’s the only tool which sits in between manual hacking with BURP repeater, and automated scanning with BURP scanner. To use it, just send a suspicious HTTP request from BURP proxy to Sentinel. Then the user is able to select certain attack patterns for selected parameters (say, XSS attacks for parameter “id”). Sentinel will issue several requests, with the attack patterns inserted. It will also help find suspicious behaviour and pattern in the accompaining HTTP responses (for example, identify decoded HTML magic chars). The version in the BApp store is old and obsolete. The URL to BurpPlugin-full.jar is correct. The code is under active development, and I’m always open to feedback.